Capturing the modern world with intensity, Max Beckmann was one of the leading German artists of the twentieth century. Though he is often classified as an expressionist artist, Beckmann adamantly rejected the label, and is today understood as one of the forerunners of theNeue Sachlichkeit (New Objectivity) movement. Born on February 12th 1884 in Leipzig Germany, Beckmann’s work emerged from the context of World War One and Two. His prints and paintings are marked by a desire to grasp the fear, intensity, and uncertainty of the human existence. Beckmann began his artistic training at the Großherzogliche Kunstschule in Weimar, and started his career as a painter and printmaker upon settling in Berlin in 1904. At the outbreak of World War One, Beckmann volunteered for the German army’s medical corps, but was shortly thereafter discharged because he had suffered a mental breakdown. Beckmann would spend the next decade depicting the doomed Weimar Republic. His works from this period are sinister and foreboding; coloured canvases are densely populated by a range of characters, illustrating the chaos of post-war urban life. Between 1918 and 1919, Beckmann produced a portfolio of black and white prints titled Die Hölle (Hell). The prints capture scenes of devastated Berlin, whose inhabitants are tortured by the acceptance that their city is doomed. Adam and Eve was completed after Beckmann’s military service, in 1917. The painting is not a traditional landscape or large-scale narrative scene, as was encouraged by academic conventions. Instead, Beckmann composes a shallow space with jagged outlines and flat planes of colour. The painting is mostly devoid of colour, dominated only by grey tones. It is this sombre grey palette against which the red eye of the serpent is contrasted. The naked figures twist brutally, painted in a crude, almost medieval-like manner. The Neue Sachlichkeitmovement sought to reinvigorate German tradition within the context of modernity. As such, the painting acts as an allegorical warning against the temptation of violence and cruelty – both of which plagued Germany during World War One. After the war, Beckmann settled in Frankfurt, and was appointed as professor at the Städelsches Kunstinstitut Frankfurt, where he taught for seven years. In 1933, the Nazi party dismissed Beckmann from his position and removed his paintings from the Berlin National Gallery. Four years later, the day after his work was included in the opening of the exhibition on ‘Degenerate Art’ (Entartete Kunst), Beckmann fled to Amsterdam, where he would remain for ten years. This marked the beginning of a period of isolation and anxiety. Nonetheless, his time in exile was also one of his most productive periods. Departure (1932-35) is one of Beckmann’s experimentations with the triptych format. Today, the painting is considered one of the emblematic artistic responses to the Third Reich. The three-part format recalls medieval altarpieces, and the narrative is similarly inspired by traditional tropes of sin and salvation. Yet, the iconography is ambiguous, lending the painting a modern edge. Demonstrative of the brutality of wartime conditions, Prunier (1944) depicts a famous Parisian restaurant that Beckmann had often frequented in the 1930s, but this work, too, was painted during his time of exile in Amsterdam. The figures are captured with brutality, their arms elongated, their heads tilted upwards while they devour luxurious seafood. The use of red colour evokes passion. 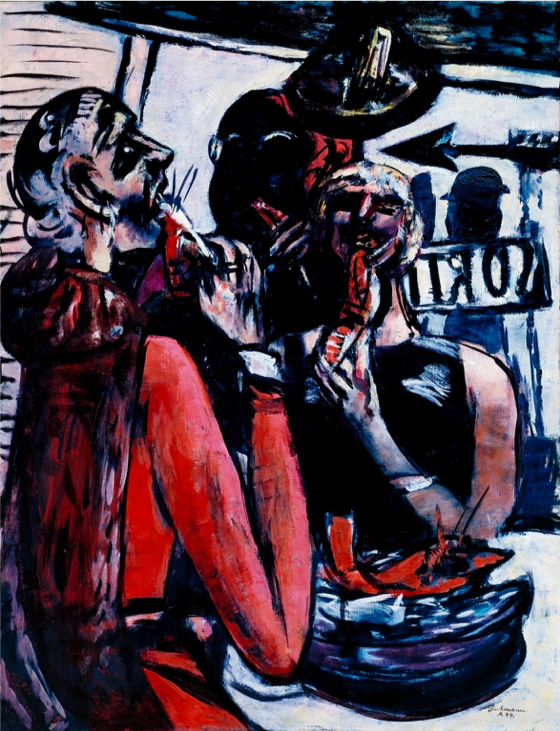 The figures, who once would have been elegant and composed customers at this luxurious restaurant, are now depicted as vicious, animalistic – giving some indication as to why Beckmann titled the work ‘Gobblers’ in his diary. Beckmann successfully paints a haunting critique of tumultuous wartime conditions, and how these conditions shape desire. His critically engaged narratives are haunting, expressive, and most of all thoroughly modern in their engagement with the brutal reality of the human existence. “Max Beckmann, German, 1884-1950.” Museum of Modern Art. Accessed 6 February 2019. https://www.moma.org/artists/429. “Max Beckmann 13 February - 5 May 2003.” Tate Modern. Accessed 6 February 2019. https://www.tate.org.uk/whats-on/tate-modern/exhibition/max-beckmann. “Max Beckmann 1884-1950.” Tate Modern. Accessed 6 February 2019. https://www.tate.org.uk/art/artists/max-beckmann-720. “Max Beckmann.” The Solomon R. Guggenheim Foundation. Accessed 6 February 2019. https://www.guggenheim.org/artwork/artist/max-beckmann.